French actress Marie-Christine Barrault on the set of L'Etat Sauvage by Christian Simonpietri, 1978. 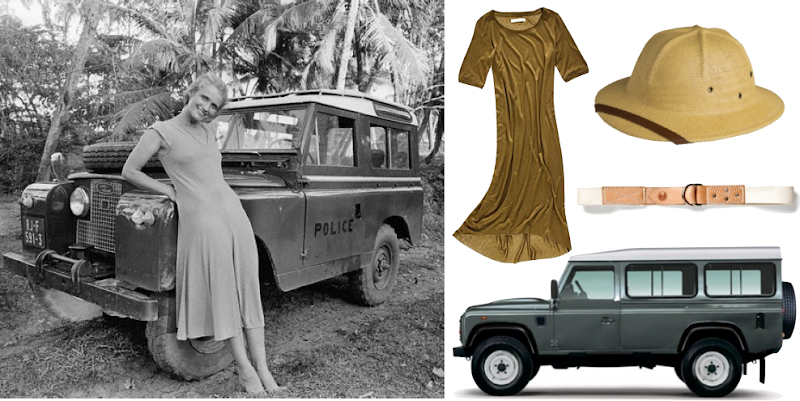 Long Tee Dress ($88); Pith Helmet ($43); Apolis Voyager Canvas Belt ($68); 2012 European Land Rover Defender. Great interpretation of her classic look. Want that Defender so bad! love this inspiration, don't you wish you could just step into this picture! if only one could wear a pith helmet in normal life. Fabulous. This summarizes my idea style! I'm so so happy to have found your sight. Alas we can celebrate being tomboys and not bother with apologizing for wanting/needing a touch of menswear in our everyday look.